This is the most distant airport in Oslo, as well as the smallest. It is located in the small town of Sandefjord, about 110 kilometers south of the capital. It is mainly used by low cost companies. With only one terminal, it is open every day from 04: 30 to 00: 30. Inside there are no duty-free shops, shopping areas and restaurants. The wifi line is available throughout the hotel and is free for everyone. Norwegian Air Shuttle: Alicante, Gran Canaria, Malaga. Ryanair: Alicante, Bergamo, Krakow, Gdańsk, Gran Canaria, Katowice, London-Stansted, Malaga, Malta, Manchester, Poznan, Tenerife-South, Warsaw-Modlin, Wroclaw. Thomas Cook Airlines, seasonal: Tenerife South. Widerøe: Bergen, Copenhagen, Stavanger, Trondheim. season: Bodø, Tromsø. Wizz Air: Bucharest, Gdansk, Katowice, Lublin, Poznán, Riga, Skopje, Szczecin, Warsaw-Chopin, Vilnius, Wroclaw. From this link, you can purchase your flight to Sandefjord Torpe AT THE LOWEST PRICE! It takes just under two hours to reach Oslo by train. 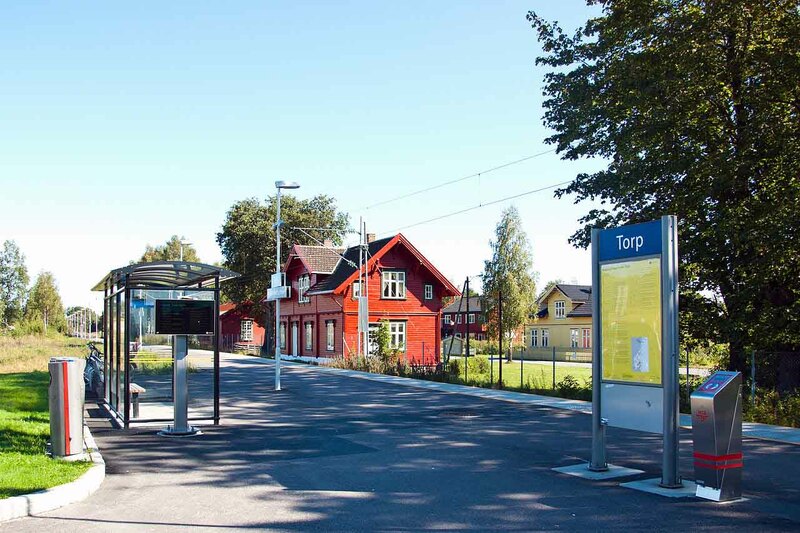 Just take the shuttle to the Torp train station at the airport exit. Travel time is approximately 8 minutes. From Torp, the NSB Regiontog local / intercity train line operates, Lillehammer - Oslo Airport - Oslo Sentralstasjon and Skien. The one-way ticket to Oslo Central Station costs 289NOK (about 29 €). From Torp, Oslo airport can be reached by train in about 2 hours and a half. Torp-Ekspressen is a shuttle transfer service to the city of Oslo. It is operated through the line UniBuss which connects all Ryanair and Wizz Air flights. The ticket for the capital costs 269NOK per adult. Info and timetables through the official website, available at this link. The comfortable and efficient buses operated by NOR-WAY Bussexpress allow you to reach Skien, Porsgrunn, Ulefoss, Bo and Seljord. During the winter season, some lines operate for the Gol, Geilo and Hemsedal ski destinations. As an alternative to trains and buses, directly at the airport, it is possible rent a car to reach any destination.